"An international non-profit and non-governmental community-based federation" that started in 1978. The site has legal and international news, and is organized by broad topic (i.e. homophobia, the United Nations, etc.). The web site of one of the oldest GLBTQ civil rights groups in the United States. 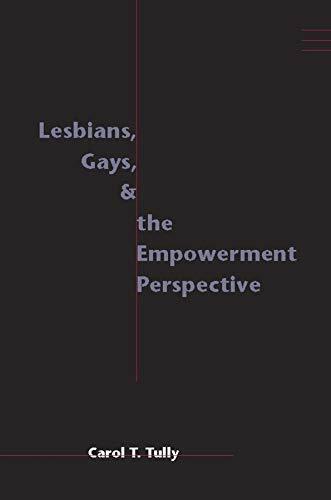 The most comprehensive resource to date on the methods of empowerment with lesbian and gay clients, this book explores the history and politics of gay identity and explains the basis and development of the empowerment approach in social work practice in the United States. After analyzing the different types of homophobia (individual, institutional, and internalized) and how these are manifested in real life situations, Tully addresses the special needs and issues particular to three age groups: gay and lesbian youth, adults, and older clients. The author offers practical applications for the social worker and client at the micro-, mezzo-, and macro-levels, from helping a teenage client to discover a personal sexual orientation (micro), to organizing a social event for lesbians and gays (mezzo), to building a community coalition (macro). Eye-opening case studies are provided for each age group and cover everything from defining problems, identifying the underlying issues causing them, understanding the role of homophobia, and the application of the empowerment perspective.